In the long struggle between the United States and the Soviet Union, from the end of World War II until the end of the Soviet era in 1991, there were intense moments of high drama, like the Berlin Blockade and the Cuban Missile Crisis, intermixed with moments when the icy hostility melted a bit. With both countries armed to the teeth with nuclear weapons of a power sufficient to destroy out planet many times over and a firm policy on both sides with the ironically apt acronym MAD (Mutually Assured Destruction), the stakes that world leaders were playing with could not have been higher. The path that eventually led to the defusing of this dangerous situation was not direct. Certainly the final act was played out by Ronald Reagan (undoubtedly his greatest role) and Mikhail Gorbachev, but long before that a young Texan, a classical pianist, was one of the first to breach the barriers between the two countries. In 1958 he won the Tchaikovsky Piano Competition in Moscow, the first American to do so. He played two great Russian concertos in the last round of the competition: the Tchaikovsky 1st and the Rachmaninoff 3rd. He won the hearts of the Russian people as well as the judges of the competition. Nevertheless they cleared their decision with Premier Nikita Krushchev. Krushchev reportedly asked them: “Is he the best?” When answered affimatively he stated: “Then he should win.” After the competition he returned home to a ticker-tape parade in New York City, and a full concert schedule. His records (LPs) were all hits, and I personally bought a lot of them. In later years he received some criticism from music reviewers for a conservative repetoire and rote performances, but at his peak he was a tremendous musician. His recordings of the Prokofiev 3rd Concerto and the Rachmaninoff 2nd Sonata are cases in point. I first saw him perform live in a concert that I believe took place in 1966 in Philadelphia. He performed 3 piano concertos in one concert with Eugene Ormandy and the Philadelphia Orchestra. The 3 concertos were the Mozart number 25 in C major, the Beethoven 4th, and the Rachmaninoff 2nd. I well remember his appeararnce on stage, sitting very tall and straight-backed on the piano chair, swaying side to side with the music. Playing 3 concertos in one concert was and is quite a feat. It was rebroadcast on the Philadelphia classical music channel (WFLN) a few weeks later and I made a tape recording of the whole concert from my little transistor radio. Over the years I lost all my old tapes. I wish I still had that one. I have never heard of another recording of that historic concert. 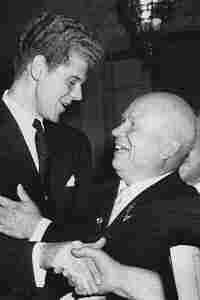 Cliburn appeared frequently at the Robin Hood Dell concerts. These were summer concerts performed outdoors in Philadelphia. On these occasions he wore white formal attire. My friends and I attended these concerts and at the end of each concert, went up to stand in the front row to watch Cliburn give a series of encores. We went often enough to know that when he played Chopin’s Polonaise in A flat it would be the last encore of the evening. He was always generous with his encores and gracious to his audiences. 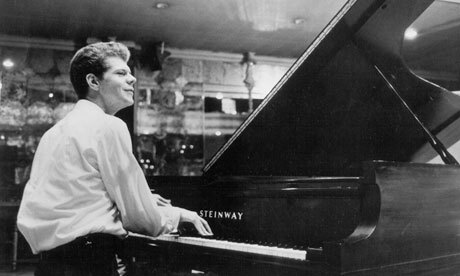 Van Cliburn died on February 27, 2013 at age 78. He played for presidents, world leaders, and for all the rest of us. He was a sorely needed bit of warmth in the midst of the Cold War. By any measure he was a great American and I count myself fortunate that I was able to see him perform in person on several occasions.